The website offers information, coupons and a place for you to designate your favorite school. You may already have some of these box tops in your kitchen cabinets now. So search your shelves, clip along the dotted line and send the coupons with your child back to your designated school site. You will be helping your school by shopping for groceries. 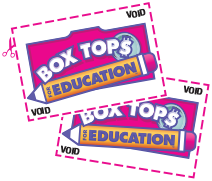 **Tecumseh Middle School will bring their box tops back during Rewards Race which is the week of September 17-28 to be turned in during advisory period but box tops will be accepted all year at all sites. The top three classes will get a snack party.